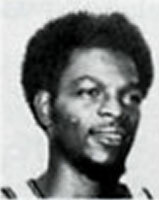 Drafted: Selected by the Buffalo Braves in the second round (15th pick overall) of 1972 NBA Draft. I graduated from Northwestern in 1961. In that era. I knew Ted Haynies sister. Saw the 67 Championship game @ Cole FH. Harold Fox and Turner Ogden were the best backcourt in Germany 1978-1980,I miss those brothers,they were 2 great men on and off the court. Harold Fox and Turner Ogden in the backcourt had Baumholder Germany rocking like an earthquake in 78-80,I miss Harold and Turner,they were 2 great men. Played against Harold in in Germany he was with Baumholder and I played with Hannah for the V Corp basketball championship he was tough. The funny thing about that was I use to watch him at the Aud when he played with Buffalo then me playing against him years later. Played JV in 1967--Harold Fox was the BEST. Saw the 64 point game. Harold played about 2/3 of that game. Along with Mark Christian they were the greatest players I ever saw. I was Harold's French teacher at NW and am so glad to read that he did so well. I remember him fondly and wish him the best. Having had the pleasure of watching the 1967 Maryland State Championship game and playing on the JU team in '71-72 with Harold I do believe he was the best point guard in the nation. He played big and rebounded like no other guard. I was also on the UM team with Willie Allen back in 1968-71. Both are truly fine gentlemen and it is an honor to know them. Anyone knowing where Harold is let me know. Thanks. I was a bench rider on the RMHS team and you're spot on! "Destroyed" is exactly the right word. I got in the game with about 5 minutes left and had the dubious task of guarding Harold Fox. He took pity on me, just smiled and passed the ball. I felt like a young brash gunfighter who life had just been spared. What a time!